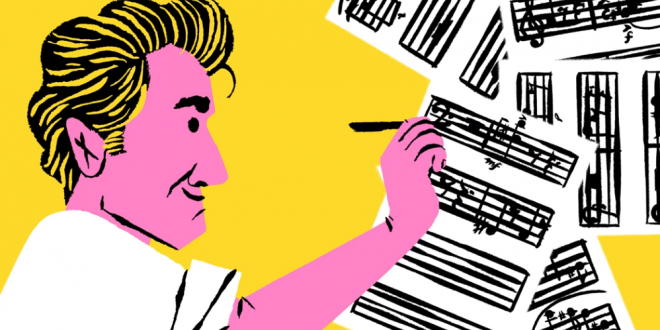 Google Celebrates Leonard Bernstein's 100th Birthday - Joe.My.God. Bernstein, who died Oct. 14, 1990, aged 72, was the youngest conductor ever to lead the New York Philharmonic Symphony Orchestra, in addition to being the first U.S. conductor to rise to international fame, leading a 1953 performance of ‘Medea’ at Italy’s renowned opera house, La Scala. After a whirlwind life as a young man, Bernstein married Felicia Montealegre, in 1951. He was thirty-three; she was twenty-nine. Once Bernstein became the music director of the New York Philharmonic, in 1958, she entertained the musical and social world at home. In general, she required rules and order, while her husband luxuriated in his own habits, some disciplined, some not. They were temperamentally at odds, but they adored each other. An eager paterfamilias at home, he remained sexually active with men. Felicia knew from the start and was hardheaded about it. At the time of their marriage, she wrote to him, “You are a homosexual and may never change—you don’t admit to the possibility of a double life, but if your peace of mind, your health, your whole nervous system depends on a certain sexual pattern, what can you do? I am willing to accept you as you are, without being a martyr or sacrificing myself on the L.B. altar.” But he did live a double life, and Felicia wound up tending the altar. A major period of upheaval in Bernstein’s personal life began in 1976 when he decided that he could no longer conceal his homosexuality and he left his wife Felicia for a period to live with the musical director of the classical music radio station KKHI-FM in San Francisco, Tom Cothran. The next year Felicia was diagnosed with lung cancer and eventually Bernstein moved back in with her and cared for her until she died on June 16, 1978.